...is being a meteorologist in Florida. Thankfully the thunderstorms don't usually last very long. For our next trip to the beach, I want to make something special for Bethany that I used to have as a kid when my family went to the beach called onigiri. Onigiri are rice balls with various other ingredients. They are a great picnic or outing food. Onigiri can be pretty simple but I lacked one important ingredient. No, don't worry I have plenty of rice. The ingredient I need is a pickled plum called umeboshi. It's not a requirement for onigiri but it almost seemed like one when I was a kid because that's usually the kind we had. My mouth waters a little just writing about it. There are several Asian grocery stores in the Sarasota-Bradenton area. Going to a new store can be exciting but it can be disappointing. I've come to appreciate some Thai, Viet, Korean and Chinese cooking but I am usually looking for something Japanese. Unfortunately, the Japanese section of an Asian grocery store can be quite small. I am happy to report that isn't the case with Oriental Food and Gifts. I was actually very impressed with what they had. They had everything that I had hoped to find and more. They had all kinds of sauces, noodles, rices, flours, canned vegetables, dumplings, frozen fish (including sushi grade tuna and salmon), mochi and there was even a whole aisle of sea vegetables (I call it that not because I dislike the term seaweed but because it might sound more appetizing to my Western-palated readers). They also had some dishes, cookware and a small selection of clothing. Pictured is what we came away with. 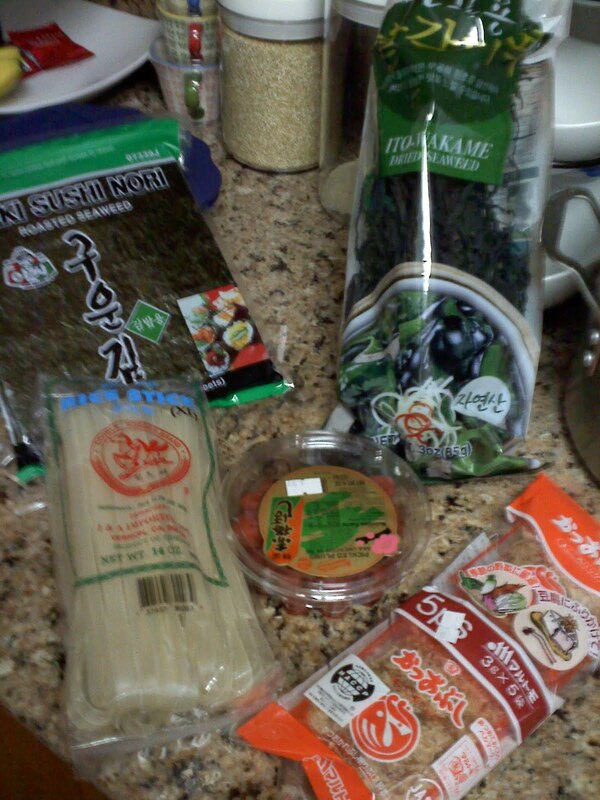 Clockwise from top left: nori (the kind of seaweed vegetable that is used to wrap sushi), wakame, bento flakes, wide rice noodles, and in the center is the umeboshi. The heat is crazy, we are crazier. One of my favorite things in Sarasota is the farmer's market every Saturday. Fresh fruits and veggies, flowers, artwork, fresh fish, old guys playing their steel guitar on the street corner, even a booth with g-free baked goods. I love things like this. In the background is one of my other favorites... Whole Foods! Steve and I had been talking about walking down there one Saturday morning....well, Steve wanted to run, but then I reminded him who he had married. Anyway, we planned to do it last Saturday... we slept in a little later than planned, then or course I kept forgetting things, so it was already pretty hot when we got started... but that didn't stop us! It was about a 25 minute walk/jog to the Farmer's Market. We picked up a couple things, then headed over to Whole Foods to find some lunch! Steve really liked the eco-roof on this building. I really like the clouds. After our lunch we were energized for the walk back. There are sculptures all over downtown Sarasota. We saw this one on the walk back...there were a bunch of them, different sizes, in front of the newspaper office building. Kind of random. Back home! This path goes from the parking lot back to the little park behind our apartment building. We pretty much crashed after we got home... but it was a fun adventure!